One of the gruelling and daunting places to work is the newsroom. It is a hectic four-wall confinement, where one deals with sources that sometimes act funny when you are trying to get even the simplest of stories. By the time you are done correcting the tenses, spellings to make the Queen smile and ensuring that verbs are correctly used, it is way past normal working hours. Once in a while journalists, get a break from the hassle and bustle of the newsroom, time to forget a little about the pressure of gathering news. And so on Friday, MultiChoice Malawi treated journalists to a media retreat at KuNgoni Cultural Village at Mua in Dedza where we were hosted by Father Claude Boucher alias Father Chagomerana Chisale. The over 40 years that he has spent living and working among Malawians have made him more than a citizen. His knowledge on Malawi culture, especially within the Ngoni, Yao and Chewa tribes, goes beyond him being a trained anthropologist, as he has studied the traditional practices of these cultures. Throughout the one hour session with Father Chisale in the well stocked Chamare Museum, the adopted local of the Canadian missionary, he documented the gule wamkulu. As a long-term advocate for the importance of recognising the richness of African culture, among Africans themselves and in the church and international community, he established the Kungoni Centre of Culture and Art in 1976. One thing that stood out from his briefing was how Father Chisale linked culture and religion. “I did not come here with God in my suitcase. I found him here, among local people. Through my interactions with them, which generally centred on culture, I found God,” he said. Today, Kungoni operates a museum, art gallery, small research library, a shop that sells some of the most creative carvings and other artworks to be found in Malawi, returning significant income to the local community of carvers and artisans. In this way, Father Chisale believes art and culture is being passed on from one generation to the other. “Let’s preserve our culture, we can embrace other changes but we should not forget out culture,” said the old father, who comfortably sat down on a simple wooden chair. His dressing, a simple African attire, a short Agbada and slippers, gives little about who he is. But when he speaks fluent Chichewa and meticulously articulates Malawian culture, it becomes more baffling. “Kungoni is the hub of everything artistic. 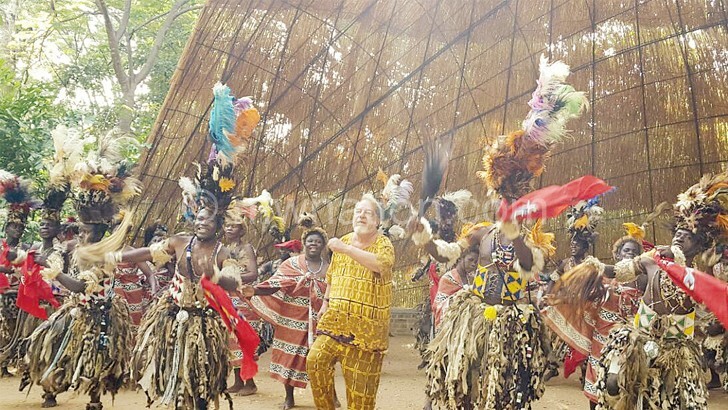 From wood carvings, jewels made from guinea fowl feathers, plastics, banana barks, to a dance troupe that transcends across cultures, we have everything here,” he said. It sounded like he was boasting, but when our guide Chikondi Teputepu took us through wall hangings of the museum that tell a story from the day Mua Mission was discovered in 1902 to date and then rooms housing almost all the Chewa, Yao and Ngoni traditions as well as passage of rites, most of the journalists realised what the father meant. The amphitheatre; Matako Achita Kupekesana, was the hive of activity as the dance troupe took the visitors and people within through a journey of Malawian traditional dances that included ingoma, chisamba, chimtali and gule wamkulu. Father Chisale introduced each dance with so much ease as well as the physical variety of the characters, provided analyses of the songs, dances and often codified messages that are delivered through word and action. The dance got interesting when gule wamkulu pranced onto the grass thatched stage. This is in a complex character portrayed by a fiercely-horned, black-faced mask topped by a pot of smoking coals. Generally, mbaula dances around, giving gifts but on this day, he only allowed people to make popcorn on his head which was shared with the audience. “Traditionally, this generosity is a deception to hide his true character. He is really after power, someone else’s wife, undeserved wealth, or all three,” said Father Chisale before he introduced the last dance, kasiya maliro. Represented by a stylised antelope and before character spun to the frenetic beat of drums, Chisale explained: “this is a form of the giver of life and she is there at every important ritual, including death and the initiation of both boys and girls. These are the intricate forms within depicting Chewa rituals”. Just like with other dances, he joined kasiya maliro before calling it a day.